While some trends may only be clear to professionals working in the industry, others can be apparent to consumers and the general public. One major trend that fits into this latter category is digital signage and the incredible rise of this market in recent years. However, while digital billboards now tower above roads and buildings around the world, print and traditional techniques still have a major role to play in this sector, as brands look for the most effective way to connect with consumers. Description: Ahead of the much-anticipated release of its Christmas advert for 2017, retailer John Lewis teased consumers by making some subtle changes to storefront signs on the front of some shop around the UK. The ‘o’ in John and ‘e’ in Lewis were both switched to giant eyes, ready to welcome ‘Moz the Monster’ to its advert. Description: This innovative, data-driven campaign saw Audi update road users about driving conditions, while at the same time promoting the built-in features of its vehicles. For example, when traffic was heavy, the creative alerted drivers to the ‘Pre-Sense’ in-built technology package for predictive safety. Description: Visitors to the Greater Columbus Convention Center in Columbus, Ohio, in the US were able to see a giant version of their own face, thanks to this special LED sculpture by Matthew Mohr. Users simply took their picture at a photo kiosk next to the 14ft installation, which featured 24 horizontal bands, and this was then projected onto the digital screens. Description: Czech football club Viktoria Plzen used sign-making techniques to transform the bench dugout areas at its home stadium into giant beer cans. The benches required two tonnes of metal and 300sq m of aluminium. The project marked a new partnership between Viktoria Plzen and local brewery Gambrinus. 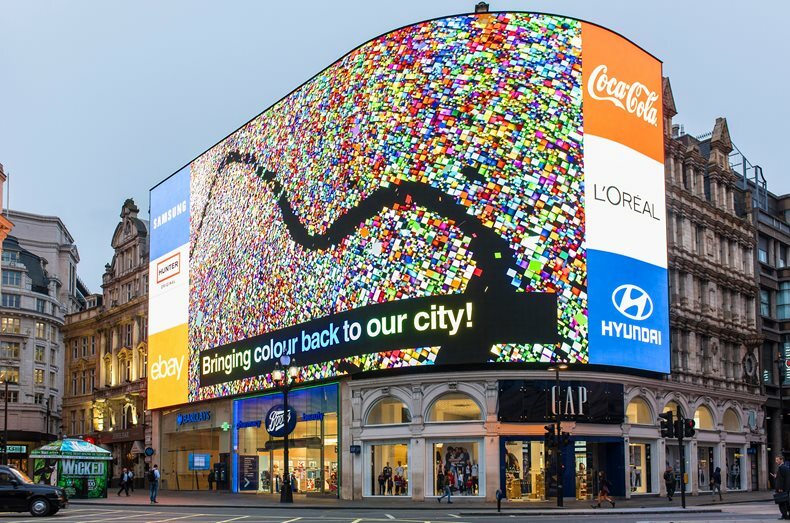 Description: Perhaps one of the most famous examples of digital signage in the world, the Piccadilly Circus lights were switched back on in October 2017 after undergoing a major refurb. The first image to appear on the revamped display was a patchwork ‘quilt’ featuring smaller pictures, each sponsored by members of the public to raise funds for charity Barnardo’s. Description: PressOn worked with the Flower Council of Holland to create this special application to promote an exhibition at the National Gallery in London. The sign combined digital print with 26,500 real flowers, with PressOn having a helping hand from a team of almost 30 florists. The printed section of the sign was printed on a HPLX3500, while PressOn used a Kongsberg XP Cutter to make 30,000 slits for the flowers to be inserted into. Description: Perhaps not the most colourful of applications, but this sign made us chuckle. One disgruntled resident in Dullingham near Cambridge in England put up this sign encouraging dog-walkers to try out a new yoga position bending over to pick up their pet’s poo. Description: Activist brand Sky Ocean Rescue won a top prize in Ocean Outdoor’s digital creative competition with this campaign promoting the dangerous level of plastic in the ocean. Consumers held the phones up, with the shadow on the sign transforming into an image of plastic on their phone. The multi-channel effort also saw consumers given reusable free bags-for-life to support the effort. Description: Clear Channel Outdoor expanded its digital signage network this year by rolling out is first street-level digital ads in San Francisco. Clear Channel Outdoor plans to fuse the Digital Urban Panel into its RADAR campaign this year, making it the first street-level media that can reach audiences based on their travel pattern and behaviours derived from mobile data. Description: The site of some of the world’s most famous neon signs, Las Vegas is always growing and upgrading to cater for the needs of its visitors. This means signage that once lit up the famous Strip has been removed and, in some cases, thrown away. However, experience designer Craig Winslow is using projection mapping to bring these signs back to life at the Las Vegas Neon Museum as part of a new exhibition. Description: Looking at the new signs on the Strip, Yesco came up with this huge application for the Forum Shops at Caesars Palace. The 85ft-high digital billboard is set atop Corinthian columns and features 6,000sq ft of LED real estate. Description: The brand new, multi-use Perth Stadium opened its doors for the first time in December and with a capacity of 60,000, became the third-largest stadium in Australia. Daktronics supported the new venue by installing eight LED displays around the venue, including two huge applications at each end of the stadium. Each of the displays measures 10m high by 34m wide, offering 340sq m of display area. Description: This clever digital signage application targeted consumers who had purchased clothes in a shop, encouraging them to keep their new threads looking clean and new with Ariel. The advert ran in the UK. Description: Los Angeles artist Nancy Baker Cahill used digital signage in a new way by featuring abstract digital paintings across tandem billboards. Situated on the famous Sunset Boulevard, the installation was not only the artist’s first public art exhibit, but also the first times digital signs have been used to show virtual reality drawings. Description: This tongue-in-cheek application comes to us from Daytona, Florida, in the US, where Flager County Jail installed a neon sign advertising vacancies in an effort to deter crime in the local area. Given the new name of the ‘Green Roof Inn’, the jail also installed a second sign to list its various features, such as no privacy, group bathrooms and showers, and designer jewellery for all visitors, such as handcuffs and leg irons. Description: Persil was another big brand to use digital signage to interact with consumers, streaming live coverage from a ‘place of play’ with data such as the weather and distance from the location. Consumers could then hold up their phone to the screen and get directions. The sign was part of a wider campaign to encourage children and their parents to be more active outdoors. Description: Kinetic linked up with Dell and Sony Pictures for this campaign that allowed consumers to “control” comic book hero Spiderman using their mobile phone in Times Square. The game was projected on billboards by Dell Precision mobile workstations. Description: The Hospital for Sick Children picked up an industry award for this omni-channel campaign. Initially featuring on the Air Canada Centre in Toronto, the ‘Vs.’ campaign was extended to other billboards around the Canadian city to show how sick children are fighting back against their illnesses. The campaign also included transit shelter ads and streetcar wraps. Description: Major League Baseball team the Atlanta Braves installed a 69ft-long curved Nixel series LED display at its new SunTrust Park ballpark last year. The display is wrapped around a metal baseball, suspended over a water fountain. With plenty of innovation around in the signage sector, it seems that the type of technology and techniques in this market stretch past print and digital. Keeping up-to-date is critical for those companies involved with this type of work. The European Sign Expo, which will take place alongside FESPA 2018, will allow industry members from around the world to find out more about the key trends and latest technologies in sign-making. The event runs in Berlin, Germany, from May 15-18.